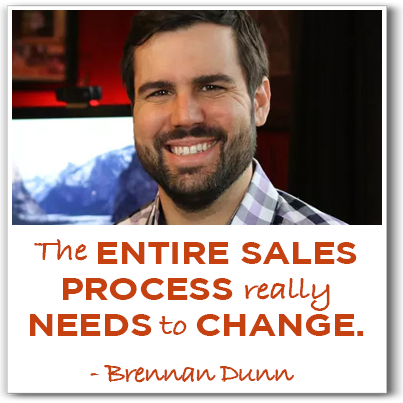 Brennan Dunn has helped over 14,000 students and freelancers learn how to increase their rates to charge what they’re worth, earn more money and work with better clients. Rich: Brennan Dunn is the founder of Double Your Freelancing and helps teach freelancers and consultants how to earn more money and work with better clients. His best selling course, Double Your Freelancing Rate, has helped over 5,000 students increase their freelance rate. His free pricing course, Charge What You’re Worth, has helped over 9,000 freelancers and consultants charge what they’re worth. Brennan, welcome to the show. Brennan: Hey, thank you, Rich. Rich: Alright, so Brennan, you seem like just the man to talk about pricing. How did you find yourself giving expert advice to other freelancers and consultants? Brennan: It was really accidental. So I had bootstrapped an agency and got it to 11 employees, we’re doing a few million a year in revenue, and before that I was a freelancer so I didn’t really know how to price. I was just kind of reverse engineering what I made as an employee and kind of chose an hourly rate and went from there. But as I grew this business and kind of surrounded myself with other agency owners and started to really read about the theories around pricing, I realized the issue I had was that I was selling myself and my team as a commodities and we were a web development company. So I was selling programming and coding and everything else, and I didn’t really know how to respond to people questioning paying our $100/hour compared to someone else’s $10/hour. So I really wanted to better understand the psychology around pricing. So when I started out it was freelancing at $50/hour, which I thought was great. I did the math and multiplied that by 2,000 and it told me I’d have a six figure revenue. Completely ignoring all the overhead that comes with running a business. But as I grew this agency, I got it to the point that I was billing out my team at $10k a week, per person. Which is a pretty big jump from $50/hr individually. And nowadays when I individually consult – which I don’t do that often – it’s upwards of $20k a week. What I like to think is I’m giving my clients a better product and they’re paying a premium for that. So what I’ve learned and has become my expertise is understanding how to quantify the value that you deliver to your clients. And how I got to engage in discussions like this was, I started a software product called PlanScope and it’s a project management tool. And for support you usually expect people to call in with bug reports or whatever else, but people started to write in with questions about advice on how they could charge more or get more clients. And I realized firsthand that a lot of people were canceling their subscription because they ran out of clients. So that’s how I got in the training business, I guess. But yeah, it’s been a wild ride ever since I started doing that. Rich: Alright. I think we’re definitely going to have to dig a little deeper there, because I feel like we went from billing $50 an hour to billing out for $10,000 a week. So it’s interesting, you did web design – that’s what I do during my day job – I know that most small businesses would love to charge more. But they’re afraid that they’re going to lose business is they do. I know that I’m not competing just with the guys down the street , but all over the world, including people charging pennies on the dollar. So what do you say to people that have objections like these? Brennan: The entire sales process really needs to change. I can give a lot of really good ideas for the listeners, especially on how to kind of shift the way that you sell to facilitate that. But the problem is, when you’re selling yourself as a commodity – when you’re saying, “I build websites” or “I can set up marketing campaigns” – you’re basically establishing yourself as a commodity. So if your title is “freelance web designer”, why should someone pay you what you’re asking for when there are people all over the world who can subsist on a lot less than we need to subsist in the Western world on, and how do you compete. If they’re web designers and you’re a web designer, why should they buy from you? It’s the same thing if I wanted to refuel my car, why would I go to the gas station that’s 10x as expensive as the one across the street that’s selling it for only $2.00 a gallon. The product needs to change. And what that means is what you do when it comes to everything from qualifying a new lead all the way to issuing a proposal. What needs to change is basically what you’re proposing to do. What most of us do is we’ll say, “I’ll do this, this and this for you,and for all of that I will charge you either this much money or this much an hour.” And that’s typically what most of us do. What I do differently though is I really dig into why they need that website. So what actually is making them willing to spend money on a website? Why are they firing whatever they have now and looking to hire a new website? When you look at it like that and when you start discussing with prospective clients about why it is they’re looking to do this, you start to learn about their business and their business needs and kind of where the website they have currently fits into their overall sales funnel? And what the deficiencies they believe are happening as a result of that site? When you start to shift the conversation away from what it is you’re doing and more towards what it is they’re looking to achieve, that’s when you can start pricing really on the value that you provide to your clients. Rich: Alright, I love the idea of that, and I’d like to think that I do that for my clients. And I ask them questions about what success is going to look like and why do they need to change it. My concern is, we get to that point where I have convinced them of the reasons they need to make a change, but at the end of the day I’m still selling them a website or social media consulting or whatever it may be. How do we keep them from taking a look at what we’re providing – even if they get that we understand their business model better than anyone else – and not just compare apples to apples? Brennan: Shop around with it, yeah. I do things differently, and one of the things I try to do is I don’t try to sell a website consultant project. What I try to sell is what I call a “roadmapping session”, which can also go by discovery, or whatever you want to call it. It’s really just a preliminary product that is a low financial risk product that I can offer, where I can immediately demonstrate that I’m capable of giving them value. If it makes more sense, I can walk through an example. Rich: I would love that, because we actually do discoveries here sometimes. And we also do something called a “digital marketing action plan”. And I guess on some level those are low risk, but I’d love to hear from you some specifics. Brennan: So I’ve actually got a student who had a lead come to him that they had ran a rehabilitation center that drug addicts and such would go there. So they came to him wanting a website. What most of his competitors do – and what he would have done – is started talking immediately about the website. And yeah, they might talk about the business aspects, but for the most part they’re focused on what it is we need to do and what it is that needs to get built. And what he did differently is he really dug into their business model. So the website generates leads and them the leads go to your sales team, so he really tried to figure out how many leads they get currently and what percentage of them close. So he started with that, with “what is the customer value?” If you have a patient that comes in and they’re on a bed, what is the value of that patient? And he found out from them it was about $30,000. So he then went on to the next thing. He asked how many people they typically needed to talk to before they got a patient, and they talked to about 10 people. So they have a 1 in 10 conversion rate, so simple math, a lead is valued at $3,000. So from there he worked from the things they can’t control. They can’t control the price, they can’t control how effective their sales team is. But one thing you can control and have influence on is how many qualified leads they actually get. So what he ended up selling them was more leads. He sold them really a website that the only job and purpose of that website was to generate more leads. Regardless of features or framework or anything like that, if what was being proposed to do didn’t get them closer to that goal, they wouldn’t do it. So ultimately the end result was a better product. They got a better website because the website was focused on the business objective that the client had, which was getting more people who need rehabilitation to put their name and number in a contact form. Apparently their existing website had the contact form kind of buried somewhere in the footer of their site and they just weren’t getting a lot of leads. So when he went to go to propose to them, he used a tactic that I call, “price anchoring”. The idea is that before you name your price, you anchor that against what I call the “upside” of the project. So if you can generate for them a minimum of one, new lead a month. Which isn’t a lot, but one, new lead a month they’re currently not getting, basic math would say that’s a $36,000 payoff in the first year alone. That’s $3,000 a week x 12. And that’s how he sold it. So he started with what is the problem that the business has. The problem is they don’t have enough leads. The solution is to get more leads. He offers what he will do, which is basically his prescription for getting new leads for the. Basically by the time he was able to present his cost – and I think he charged something like $15,000 – that $15,000 anchored by $36,000+ in the first year, that’s ultimately what made it so he came in as a lower risk. So a lot of it has to do with risk. A lot of it has to do with if I think you’re technically capable but I don’t think you’re a sure bet for solving the problem that I actually have. I want to hedge my bets, and the way to do that is I want to expose myself the least amount financially. So by coming in and selling a product that is inline with their business objectives, he’s lower risk. Which ultimately means he can charge more. And that’s exactly what I do, that’s what I’ve been doing and that’s how I’m able to get people to pay me upwards of $20,000 a week just to write code and write email copy for them because I’m not selling code and email copy. I’m not pricing myself at the myself rate for services, I’m pricing myself against what I realistically believe that I can achieve based off of where they are and where they want to get to. Rich: Alright, and you’re doing that in part with that anchoring you talked about where we try and determine how much each lead is worth and then we feel we can move the needle – in this case by 1 more lead a month – that’s worth $36,000, so suddenly they’re paying for this website in less than 6 months. Brennan: That’s right. And I’m pretty clear about the fact that I can’t come up with a realistic path toward delivering a ROI, if I can’t become an investment, then I’m going to pass on the project. Or, I’m going to figure out how to make myself an investment first. But if I can’t, why would I want you to spend money on me and not get a payoff? Rich: I feel the exact same way. I don’t want somebody spending money on me just because they like me. I want them to spend money on me because I’m going to make them many times that back. Rich: This sounds great in theory. And I like to think that I’m maybe not an A student but a B student at this, but here’s something that I know a lot of our listeners are going to run into. You have this whole conversation and explain to them how you’re going to make all this money for them, and then maybe you get to the point where you start talking numbers and in your mind you’re like, “This is a $15,000 value”, and they’re like, “I’ve got $1,000 to spend.” Is there a way of finding out up front – that doesn’t derail the sales process – what somebody can afford to pay? So one of the things I started doing is figuring this out when qualifying. Clients don’t want to tell you their budget because they believe that if they say, “Hey Rich, I’ve got a $100,000 budget”, that you’re going to come back with a $99,000 quote. And you don’t want to give up your rate because if you say that early on, it’s kind of like when you look for cars and you call all the dealerships, you don’t want people to do that. So what I do and what’s worked really well is I say something like, “Is your budget at least x?” And what that allows me to do is, is this a big enough project that I’m willing to actually go through that rabbit hole of a sales process. Because if it’s over $15,000 for instance, then it’s a worthwhile project for me. But if it’s not that, then it isn’t worth my time to even pursue this project. And the benefit of that is, I’m not really exposing hourly rates, weekly rates, anything like that, and they’re not giving me their budget. I’m just asking them if it’s over x, and if it is, let’s keep moving down this funnel. Rich: Alright, that makes sense. And how early on into the process do you do that? Brennan: Immediately. So when I get a new lead, I ask 5 questions. The first thing I ask is what is the business objective of the project. So I want to understand if they wrote in wanting a new website designed I’ll ask them to tell me about why they’re replacing the website you have now if you they one. And if not, what business problem are they hoping this new website will solve? And the second question will be, “Is your budget at least x?” And I also ask, “Do you have that liquid?” Meaning, if they need to go and raise money, I don’t want to go through the whole sales process hoping that they can later on get investors to pony up. I also want to typically know are they the sole decision maker on this project? Are they the ones who ultimately will sign the checks and agree to basically be my client? Because I don’t want to work with committees. I don’t want to deal with 5 different voices all vying for my attention. I don’t know if you’ve been on projects like that but they’re not fun. Rich: Oh, maybe one or two in the last 18 years. I love trying to design a logo by a committee. That’s awesome. Brennan: Yeah, exactly. So the budget, the business problem, then when are they looking to get started. Is this something that they’re looking to do yesterday, are they looking to get started 6 months from now or are they just shopping around. And finally the last question, “Have you ever hired somebody like me before, have you done something like this in the past?” And that will help me understand how much I need to educate them and set the expectations early on in that sales process. So I’m not only getting information that’s valuable to me – because one of the things I do after this is I send them a document and a link to my calendar saying lets book a 30-minute free consultation – immediately I turn the tables where it’s often the client interviewing us and I try to make it that I have a prescribed way of doing work. I have a prescribed way of running my business. And I instead, in a weird way, am the one interviewing them. I’m not doing the open ended things where the client can often get into the natural rhythm of doing what they do best, which is interviewing people about roles or whatever. I take a lot of control over the sales process, I start that with these qualifying questions, so I have a very clear way of kind of moving people through the sales funnel. Rich: I think that’s really cool Just to kind of recap this, we’re looking for the business objective, we’re looking for a budget, asking if you’re willing to spend x or more. Brennan: I’m not asking for what’s your budget, I’m saying do you have a budget above x. Because again, I know they don’t want to give me their budget early on. Rich: Right. Ok. Are you the sole decision maker, when is your start date and is this your first rodeo? That’s basically what it comes down to. And if they pass our gauntlet of fire, then we send them a link and ask them to schedule something, and we send them a document and we kind of schedule something. And we basically take control of the sales process. Brennan: That’s right. And a lot of competitors I’ve noticed are really bad at replying. We’ve gotten new work just because we’re fast at replying to new leads. Just getting a stock, templated response over to people. For all they care, It could be an autoresponder that you send out. Just by doing this, it immediately establishes that we’re professionals – I have a very professional way of doing business – and I’ve done this before. I have these questions ready to go because I’ve done this. This is what I’ve do. The big risk for a lot of people hiring freelancers especially is, is this person going to flake out? Are they reliable? And the more you can prove to them through the way that you take control over the sales process that you are reliable, the more likely they are to hire you and to pay you a premium. Brennan: To be honest, that’s why people like buying products or services. Because products have a defined way of appearing and working and functioning and everything else. When you’re just buying somebody’s time, that’s risky. There’s no guarantee that if you hire a web designer for 20 hours that you’ll get anything of value. So the more you can productize how you sell and what you’re selling, the lower risk you are and the more likely that person is to continue moving down that funnel. Rich: So Brennan, just a clarifying point; so when somebody reaches out to you and you ask them these 5 questions, is it via email or is it on the phone, or does it make a difference how they first reached out to you? Brennan: Most of my referrals and leads that come my way come via email. But we have gotten them over the phone, like when I got my agency we got calls all the time. Most of them were pretty low quality. If they’re calling in as a result of reading about us in the local paper, that’s probably not a good sign. But even if it’s over the phone, we would ask the same thing. When I was shopping around for a lawyer I remember one of them basically set up a profile for me in their CRM during that first call. They actually billed me for that time. Looking back it’s impressive that they did, but just for that initial call out of the blue to see if it’s a good fit between me and them, they had my address and they sent me an invoice. Not that I’m recommending all of you do that, but just having a structured way of doing things is always better than being loose about how you sell. Rich: That makes a lot of sense. Now I have a question, what’s your opinion of RFP’s? Do you respond to them? Brennan: I do not do RFP’s and I do not do job boards. All the leads I work with are either direct referrals from people that have either gotten work for me in the past, or people that I consider part of my ecosystem, and that’s a whole other loaded topic. But the way that I booked work with my agency was we did a lot of educational marketing. We did seminars – not a lot of webinars back then, we do them nowadays – and the purpose was, when you think a lot of how sales works, a lot is persuasion and selling somebody on yourself, then the tail end of the sales process is the details and the negotiation of what we’re going to do and how much it will cost. So one of the things we did is we did is we – at scale – accomplished that early part of the sales process. We showed people that we were experts at what we did. We taught seminars on getting started with internet advertising, or why you should build something custom versus buying it off the shelf. We did a lot of this and we built up our audience and we had thousands of people locally in our audience who would refer more work than we could handle, so we got a lot of referrals in that way. There’s also things that I’m doing nowadays for my new company – my new agency – where I have lead magnets out there. Kind of like whitepapers or email forces that move people through the funnel, and ultimately the goal is to book a short consultation call. So all the clients I work with for the most part, I’m not competing. It’s not like I’m going out there and competing over a project that somebody has listed with a bunch of other people. Most of the clients who come to me do not always realize that they have a problem at first. My goal initially is to help people see the opportunity for hiring somebody like me. That’s what I do early on and at scale through things like seminars and webinars and typical content. And then when they’re at the point where they have a project, that’s when I kick off everything I just covered. So I don’t do RFP’s, I don’t do any of that kind of stuff. Rich: Alright. So I know we’re running out of time, but I do want to kind of follow up. So at this point we’ve qualified somebody, now we’ve got this 30-minute agenda. At some point if we like them and they like us, there’s got to be a proposal. Do you have any tips for writing a killer proposal that closes? Brennan: Yup. My template for my proposal is this, I start with a “why you’re here”, so that’s where I talk about the problem. A great proposal reads a lot – to be honest – like a sales letter. Direct marketers perfected this stuff back decades ago. The idea is to keep people moving and to keep them reading the proposal and to really immerse themselves in what you’re saying. So I cover “what is the problem”, and I flip that problem on its head to find a solution. So for example if the problem is you’re out in the rain and you’re cold, the solution is not an umbrella, the solution is to stop being cold and wet. So I paint a picture of what tomorrow could look like for their business after that. And I do a lot of this because my sales discussion early on is all focused on them and their business. And then what I do next is I basically present my offer, which is “how do I plan on bridging where they are now with where they want to be?” And then I talk about ultimately giving some social proofs. It’s the typical “problem, solution, offer, overcoming objection and social proof.” So, what objections might they have, and you should be able to – from talking to the client – you should have an idea of what sort of objections might they be thinking as you present your offer? You want to cover those objections immediately, if possible. And then one of the things I also do – which I haven’t really talked about yet – is I provide packages. So don’t just give one price. I’ve already anchored the upside early on in the proposal, and the solution is based on hard numbers that they’ve already given me, and I’m really just throwing it back in their face. And then finally at the end I present different pathways that can accomplish my offer. So usually I try to think – going back to the rehabilitation center – the thing he came to us for was a redesigned website, which ultimately became offer A, a website whose only purpose is to generate more leads for you and your business. However the only issue with that is you’re contingent upon the amount of traffic that you’re getting. So it’s not going to increase your traffic, it’s not going to do any of that. It’s just going to optimize the traffic you already have. And the second option is a more expensive option, but it’s option A plus paid acquisition, content marketing, all the things that increase that amount of traffic that ultimately goes through the funnel of that website. The visitor to lead funnel. So ideally you want to offer different options because you want people to not say, “Do I hire Rich, yes or no?” You want people to say, “Do I pay Rich this much or this much.” Have 2-3 different options so that they compete against you versus just assuming that it’s a take it or leave it sort of thing. So having options is probably one of the best things that you can do, if you’re not doing that already. And then since I kind of have an idea of if I think option A would do one lead a month, what kind of opportunities stand to be made if I can double the amount of qualified traffic than they’re getting now, and what would that mean for their business. So some anchoring happens there. And that’s it. So I let them basically understand that I know the problem that they have, I paint a picture of where they want to be – which is where they told me they want to be – I present how I think we could get there, I overcome their objections, I offer social proof and present a micro case study of something that I’ve done similar and the result of that. And then I present my packages, my different ways of accomplishing that offer. Rich: Brennan, that’s awesome, awesome stuff. I’ve been taking notes furiously, I’m sure a lot of our listeners have as well. I want to give them a reason to go check you out online and check out some of the stuff that you have, where should we send them? Brennan: The best place is doubleyourfreelancing.com. Actually if you go to the first link under the “Most Popular”, there’s a 9 lesson email course about basically what we just talked about in depth. And it covers figuring out the financial upside, writing proposals, and it’s totally free. So that’s probably the best way to kind of learn about this framework more in depth. Rich: Alright, that’s awesome. We’ll have those links, as always, in the show notes. Brennan, thank you very much for coming on and sharing your expertise in this area. If you’re a freelancer or consultant and you liked what Brennan had to say, check out his website for more information on how you, too, can earn more money and work with better clients. Brennan’s best selling course has already helped over 5,000 students increase their freelance rate, check it out for yourself! Learn how to charge what you’re worth with Brennan’s free pricing course. If you’re looking to gain control and run a better business, Brennan’s project management software may be just what you’ve been looking for. When not hosting this podcast, Rich Brooks is the fearless leader of flyte new media, a web design and marketing company in Portland, Maine. You can follow him on Twitter and see for yourself if he’s really as funny as he thinks he is. Have you gotten your tickets yet for the Agents Of Change Digital Marketing Conference? What are you waiting for? There’s still time to get your earlybird tickets now! This entry was posted in Entrepreneurship and tagged brennan dunn, double your freelancing, planscope by Rich Brooks. Bookmark the permalink. Rich, I am little confused here. It seems like the topic was focused on web design quotes but the pricing solution Brennan offers focuses on more “lead generation” which includes web design + marketing. Even If you are charging for a complete solution $15K like the example he gave, it is not enough for a year worth of work that includes Design + SEO. SEO work alone requires a lot of time and effort. I think there is a calculation problem here. I like the way you think. 🙂 Every budget is different, and SEO varies depending on where you are in the world, how competitive your industry is, and a number of other factors. That being said, every time a prospect complains about our pricing, I’m going to point them to your comment!